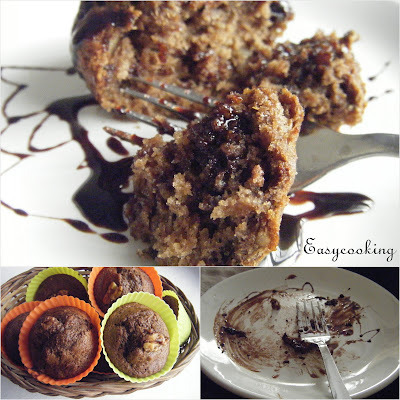 Easycooking: Chocolate,Banana & Walnut Muffins~Eggless!! Ever since I discovered these,ripe-blackened bananas do a detour and go into these muffins rather than the waste bin:).I simply love the banana muffin and end up baking the same at least once in a fortnight.It is much loved by our friends too.They make a beeline and search for my cookie tin or my glass jar,where I usually stock my baked items. Last few times I bought butter,the whole stuff went rancid.The first one was a local brand and I got it as nothing else was available,two days later I took it out and it smelled awful.It got transferred into a bottle of ghee,still smelt funny.The second batch too,though a branded one had the same fate..hmmm.So I haven't been baking much.,I got a new batch of butter which is great and I am back to my baking days..YAY!!! The fruit box was beginning to smell and the ripe bananas were pleading to be used.That’s when I remembered Sunita’s post where she had blogged about Mini-choco-banana-walnut muffins.Her recipes are always a healthy alternatives to the butter-laden ones.I hopped on and was so happy that the recipe used oil instead of butter,honey instead of sugar and atta instead of maida.I was jumping in joy and instantly made the muffins.Used the silicone cupcake moulds that my co-sis bought for me last time from abroad. 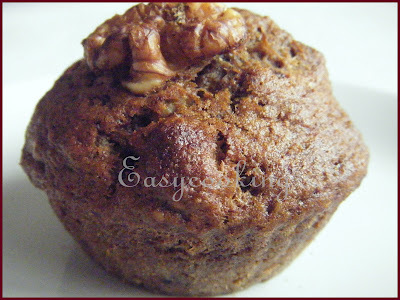 Chocolate,Banana &Walnut Muffins from Sunita's World. Awesome muffins Divya...love the dome top and they are so tempting. Your muffins look great! And I absolutely loved the silicone cupcake moulds! yesterday only I prepared banana bread and today I m seeing ur muffins..chocolate would hv gone well with banana n walnuts...right? divs im gonna try this today..its luks yum.. Delicious muffins.. Check my world food treat blog for dubai palm jumeriah tour.. Such a soft and moist muffins that to as eggless..looks fabulour! When I read your posts and see your bakes I always feel we share the same taste in food. The muffins look great. I always dream of making banana bread, banana walnut cake but have still not got around making them! I'm not a big fan of banana but that moist chocolate and walnut in here is pulling me in with a force that's not worth stopping! Good one! Love the last pict with choco syrup, that is sure tasty! Great Muffins...Hot muffins with choco syrup & a scoop of vanilla ice cream.. is heavenly!! Tempting muffins.really good.Do visit my blog when u find time. YUM!! and eggless too..though i havent really tried anything eggless...this one looks very tempting.. These look so good!! And are you having a butter shortage too? It's quite bad here in India! I love the silicone moulds!!! Your not so zebra cupcakes look so pretty too. This is my fist visit to your blog. Love the way you write and your pictures. The muffins look great! And eggless at that? I need to bookmark these for times I'm baking these for jain friends! Kanji..or is it Rice Porridge?? Simple Tomato Fry ~ Bachelors Special! !